Have a question about our MARTA fares? Give us a call and we'll help you sort it out. 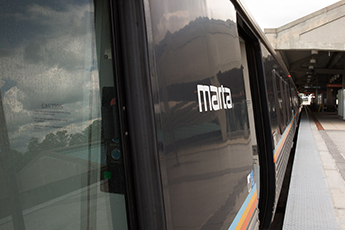 MARTA fare is $2.50 for a one-way trip — but your options don't stop there. We have passes, programs and special fares fit for everyone. Whether you're a first-timer or a seasoned rider, we have the option that's right for you. Standard MARTA fare is $2.50 with four free transfers allowed within a three-hour period. These transfers are not valid for round trips. Standard Atlanta Streetcar fare is $1.00 with no transfers allowed to MARTA bus or rail. Children 46 inches and under can ride MARTA or the Atlanta Streetcar for free (limit two children per paying adult). Riders who are 65 or older, who have a Medicare card, or who have a medical or mental disability pay a reduced fare of $1. Riders who qualify for our MARTA Mobility service and use their MARTA Mobility Photo ID Card can receive discounted fares when purchasing multiple rides. MARTA Passes may be your cheapest option if you plan on riding multiple times in one day or over the course of a pre-determined amount of days. These passes provide unlimited rides during your consecutive day travel, beginning with the first day of use. Days end at 12 midnight. Day Pass orders of 200 or more receive a group discount. The discount ranges from 5-15% depending on the number of passes you purchase. Participating universities offer 30-Day Passes at discounted prices for students and faculty. Students can purchase these passes for $68.50, and faculty can purchase these passes for $83.80. The passes provide unlimited rides through the end of the month they’re purchased in. Participating organizations can purchase discounted unlimited ride passes depending on the number of cards purchased. Every Breeze Card and Ticket comes with up to four transfers. This means you can change bus routes or switch from bus to train (and vice versa) without paying again. Transfers cannot be used for round-trip travel — meaning you can't exit a route and board the same route again at a later time without purchasing another ride. You're allowed up to four transfers within a three-hour period. Don't leave a station or a bus without tapping your card on before exiting the bus or fare gate. Otherwise your transfers won't load on your card.